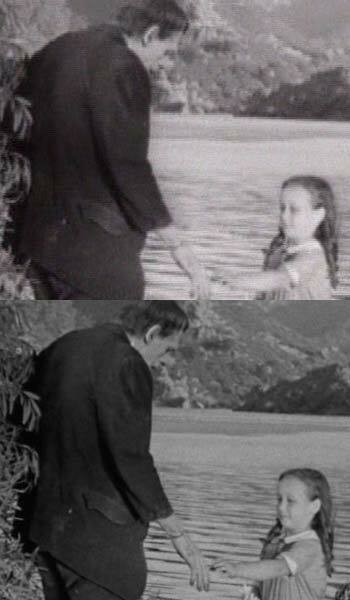 If you’re going to buy the classic 1931 Frankenstein, or any other ancient movies for that matter, on DVD, choose carefully. The graphic at the right shows a detail of the same frame taken from the two versions available in Australia. The top one is the budget ‘Silver Screams’ version from MRA while the bottom shot is from the more expensive DVD from Universal Pictures (the mob who actually made the movie over 70 years ago). The latter, according to the back cover, is ‘The Restored Version’ although there doesn’t seem to be any significant discussion of this on the disc. It does have flashes of dirt and scratches across the screen, and an uneven light balance. But it is a marvel of quality and clarity compared to the MRA version. Just look at the focus, the detail, the dynamic range. Not all of this is due to any presumed restoration of the print. The MRA version runs for 70:09, the Universal one goes for 67:09. The reason for the difference is that the Universal version is a native PAL version, whereas the MRA version has been converted from NTSC. (PAL movies run around 4% faster than NTSC because they run at 25 frames per second, rather than the movie’s original 24). This conversion manifests in significant interlaced combing on most frames, and a loss of sharpness (since NTSC’s vertical resolution is 480, and this has to be converted up to PAL’s 576). Other differences: the bit rate for the MRA version is 5.40Mbps, of which about 1.5Mbps is the audio (delivered, inexplicably, in Linear PCM) while that for the Universal version is 8.23Mbps, and less than 0.4Mbps is audio. The MRA seemed to be encoded at a constant bit rate as well. The sound on the Universal version is very much cleaner, devoid of the scratches of the MRA version. Universal also gives a commentary track and some featurettes. Then there’s the censorship. Some found one line in particular to be offensive. In the MRA version this is rendered, just after the monster comes to life, as Frankenstein saying ‘In the name of God, now I know what it’, and while his mouth keeps moving, his voice is muted (25:10). But in the Universal version, the full line is delivered: ‘In the name of God, now I know what it feels like to be God.’ (24:08) Interestingly, the subtitles say: ‘In the name of God?! Now I know what it …’, and next, ‘(voice drowned out by thunder)‘. Seems like they lifted the subtitle track from a previous version. This entry was posted in Disc details, DVD. Bookmark the permalink.